My reading of more of what Top Cow publishes continued lat night with the latest issue of Matt Hawkins’ Aphrodite IX, a series that was rebooted under his direction and features art by Stjepan Sejic, Top Cow’s premier artist. In the three issues that I’ve read so far, Matt has created a really interesting post-apocalyptic world and has populated it with equally interesting characters, whether they be the geneticists of Genesis City or the cyborgs of Speros, or the protagonist herself, Aphrodite IX. The tale so far has been one of deceit, betrayal, assassination and a race of control, which are always great concepts to base a story around. And that is exactly what Matt has been doing so far. This is a variant cover. There is absolutely nothing in this issue that Matt Hawkins does that he already hasn’t done before. Except making the story and the characters more awesome. When last we saw Aphrodite IX, she had once again been mind-controlled by her handler Burch into killing another character, someone close to the new ruler of Genesis City, Marcus. This issue deals with the fallout of that death and we finally begin to really explore how Aphrodite feels about all that is happening with her and around her. She questions what is happening to her and she struggles to come to terms with what she has done and what she might be forced to do. The previous issues were full of a lot of political intrigue, particularly in Speros since its senior military leader, Chronos, wants a full-scale war with Genesis and he will do whatever it takes to make that happen. Conversely, this issue is light on political intrigue, but is heavier on the typical Aphrodite action. And I love to see that kind of a panel, so I enjoyed all those scenes. More so since Matt mixes things quite well and he keeps the narrative flow going without any drop in the pacing to the point that things are boring or just… slow. One of the things that make this issue standout is that Matt doesn’t go the typical comics route of Aphrodite’s stealth capabilities being too tough for anyone to counter. This is something that happens to a lot of such characters and it is all a bit silly and unrealistic. It also makes the characters come across as stupid. Here, Marcus immediately brings back a tracker, an old friend, who sets about to discover just who has been killing people in Genesis. As expected, for someone like him, the conclusions are obvious, and there are also snippets of this character’s thoroughness and determination, which made for a nice change of pace from Marcus’ indecisiveness in the previous issues. Not to say that Marcus hasn’t improved significantly in this issue, but the addition of a new character was justified ably by the narrative and it also helped to move things along without getting bogged down in an unnecessary and superfluous extended search of Aphrodite throughout Genesis. Of course, the real kicker comes towards the end, when both Marcus and Aphrodite have to make an important decision, and that’s where the biggest twist in the series, so far, comes into play. Matt Hawkins has had a knack of such endings for each of the previous issues, and this one is no different, except to say that he dials up everything and fully hooks the reader to stay around for the next issue in a month’s time. As always, the art in the series is brilliant. By now, I’m quite comfortable and even familiar with Sejic’s pencils and his colours in this series, so I was able to enjoy the art that much more. At the risk of repeating myself from previous reviews of this title, I’ll say that Sejic is an artist who is in a completely different class of his own. He does things very differently and the biggest charm of his work is that his characters are always so expressive. You can always see a riot of emotions on their faces throughout an issue, something that very few artists are able to pull off. And then there’s the realism of his art style which, at the least, is like watching a high-budget animated feature. Totally out of this world. The only “negative” I have for this issue is that I didn’t like the cover at all. 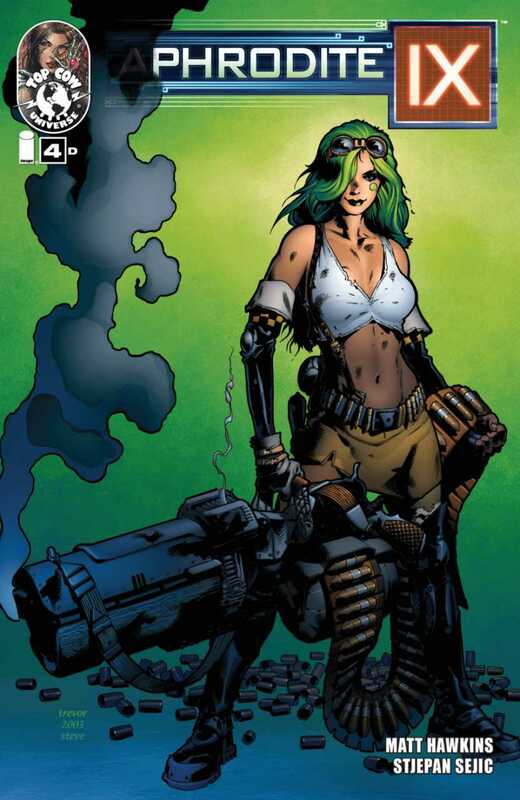 The previous covers have all had Aphrodite IX, but this one doesn’t appear to be doing the same thing. Its a very dolled up version of the character and I just couldn’t go along with it. Which is why I used one of the variants since, even though it doesn’t have Aphrodite IX, it doesn’t present a dolled up version. All I’ll say in the end is that I’m really enjoying this series and that this book is one of my favourites. With The Darkness and Aphrodite IX, Top Cow has some great titles out every month and that I can’t wait to get to the next issues. More Aphrodite IX v2: #1, #2-3. Posted on August 22, 2013, in 2013 Reading Challenge, 2013 Writing Challenge, Challenges, Comics Reviews, Review Central and tagged 2013 Reading Challenge, 2013 Writing Challenge, Aphrodite IX, Challenges, Comics, Comics Reviews, Image, Matt Hawkins, Post-Apocalyptic, Review, Review Central, Stjepan Sejic, Top Cow. Bookmark the permalink. 5 Comments.